"I believe that adulterers should be stoned to death. I believe that we should cut the hands off of thieves. I believe the Sharia should be implemented in Denmark. Maybe we should change the Christiansborg Palace [the Danish Parliament building] to Muslimsborg to have the flag of Islam flying over the parliament in Denmark. I think this would be very nice." — Anjem Choudary, while in Denmark to establish Islam4dk in June 2014. "[Choudary's network] has now been proscribed as a terrorist organization operating under 11 different names, but neither he nor any one of his associates has so far been prosecuted for membership of an illegal group." — Times of London. "The cure for depression is jihad." — Abdul Raqib Amin (aka Abu Bara al-Hindi), Scottish jihadist. The British government has banned three groups linked to Anjem Choudary, a Muslim hate preacher who wants to turn the United Kingdom into an Islamic state. The move comes after the groups were found to have organized jihadist recruitment meetings in which two Muslim youths from Cardiff were persuaded to fight with Islamic insurgents in Syria. The Home Office said on June 26 that the groups Need4Khilafah, The Shariah Project and The Islamic Dawah Association are all aliases of al-Muhajiroun, a Salafi-Wahhabi extremist group that was banned in 2006 but has continued to operate ever since then by using different names. Al-Muhajiroun (Arabic for "The Emigrants") has also operated under a host of other names, including al-Ghurabaa (Arabic for "The Strangers"), The Saved Sect (aka The Savior Sect), Muslims Against Crusades, Muslim Prisoners, Islamic Path, Islam4UK, Women4Sharia and Islamic Emergency Defence, which is still operational. Al-Ghurabaa and The Saved Sect were both banned in July 2006, after they organized a march through downtown London to protest the publication of cartoons depicting Mohammed. Demonstrators linked to the groups waved placards reading, "Butcher those who mock Islam," "Kill those who insult Islam," and "Europe you will pay, your 9/11 is on the way." Islam4UK was banned in January 2010. At the time, the group described itself as having been "established by sincere Muslims as a platform to propagate the supreme Islamic ideology within the United Kingdom as a divine alternative to man-made law" to "convince the British public about the superiority of Islam, thereby changing public opinion in favor of Islam in order to transfer the authority and power to the Muslims in order to implement the Sharia [in Britain]." Muslims Against Crusades was banned in November 2011, after the group launched a campaign to turn twelve British cities into independent Islamic states. The so-called Islamic Emirates were to function as autonomous enclaves ruled by Sharia law and operate entirely outside British jurisprudence. All of the bans have been based on the Terrorism Act 2000, which states that a group can be proscribed if it "commits or participates in acts of terrorism, prepares for, promotes or encourages terrorism or is otherwise concerned in terrorism." Section 1.1 of the Act defines terrorism as the "use or threat of action designed to influence the government or an international governmental organization or to intimidate the public or a section of the public…for the purpose of advancing a political, religious, racial or ideological cause." "That is why we have today laid an order which will, from tomorrow, recognize the Need4Khilafah, the Shariah Project and the Islamic Dawah Association as aliases of the group already proscribed as both al-Ghurabaa and The Saved Sect. "The group is also known as al-Muhajiroun. This means being a member of or supporting the organization is a criminal offense. "Al-Muhajiroun remains of significant concern to the UK and the international community, and this order will ensure that it cannot operate in the UK as Need4Khilafah, the Shariah Project and the Islamic Dawah Association." The latest ban—a conviction for membership of either group could result in a prison term of up to ten years or a £5,000 (€6,300; $8,500) fine—is unlikely to deter Choudary, who has repeatedly mocked the government's efforts to prevent him from radicalizing British Muslims. According to a report published by the Times of London on June 27, Choudary's network "has now been proscribed as a terrorist organization operating under 11 different names, but neither he nor any one of his associates has so far been prosecuted for membership of an illegal group." "If they arrest me and put me in prison, I will carry on in prison. I'll radicalize everyone in prison. My paradise and my hell are things which are beyond this reality. My paradise is in my heart. If they put me in prison I'll carry on there. If they kill me I will die a martyr. "There is nothing, really, they can do which could dampen my hopes and aspirations. I will carry on being a servant of [Allah] for the rest of my life, inshallah [if Allah wills] — whatever they do they will face the consequences of their actions on the day of judgment." According to the Times, British police keep Choudary under close watch, but say he is a "difficult target" because he is "very familiar with the law," (Choudary attended law school) especially on offenses relating to incitement. Choudary has been promoting radical Islam since the 1990s, when he partnered with the Syrian-born cleric Omar Bakri Muhammad to found al-Muhajiroun. The group disbanded in 2004 but re-emerged under the name al-Ghurabaa until that was banned in 2006. It has since responded to proscription orders by constantly devising new names to keep the hydra-like network one step ahead of British authorities. The latest ban came after it was discovered that Need4Khilafah and the Islamic Dawah Association organized meetings to recruit British Muslims to fight in Iraq and Syria. The meetings—known as "pop-up" sessions because they are advertised only by word of mouth and are never held in the same location twice to avoid detection—are effective because rather than recruiting by means of videos posted on the Internet, they use direct face-to-face persuasion to pressure young men into becoming jihadists. During such a session in Cardiff, the capital and largest city of Wales, Nasser Muthana and Reyaad Khan, both 20, were persuaded to become jihadists in Iraq. 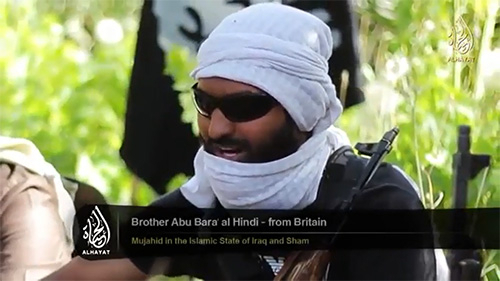 The two men, both from Cardiff, recently appeared in a jihadist recruitment video that was issued by the Sunni Islamic extremist group Islamic State in Iraq and the Levant (ISIS). The 13-minute video, entitled "There Is No Life Without Jihad," shows Muthana and Khan, as well as another jihadist from Scotland named Abdul Raqib Amin, urging their fellow countrymen to come to fight for ISIS in Syria. "Are you willing to sacrifice the fat job you've got, the big car you've got, the family you have? Are you willing to sacrifice this for the sake of Allah? Definitely! If you sacrifice something for Allah, Allah will give you 700 times more than this. "All my brothers living in the west, I know how you feel. When I used to live there, in the heart you feel depressed. The cure for the depression is jihad." "A message to the brothers who have stayed behind. You can be here in these golden times...or you can be on the sidelines. You have to ask yourself what prevents you from joining the ranks of the Mujahideen. What prevents you from obtaining martyrdom? You are going to die anyway." Meanwhile, a member of Choudary's inner circle, the 35-year-old British Islamist Abu Waleed, has appeared in a number of videos in which he outlines his vision for an Islamic state in Britain. "The kafir [unbeliever or infidel], when he walks down the street, he has to wear a red belt around his neck, and he has to have his forehead shaved, and he has to wear two shoes that are different from one another." "What is the nightmare on Downing Street? The nightmare on Downing Street, my dear brothers, is when the door of 10 Downing Street [headquarters of the British government] is kicked down by one monotheist [Muslim], and the Caliph [Islamic ruler] walks in, and establishes the Sharia. "The nightmare on Downing Street, my dear brothers, is when one monotheist pulls a rope, and raises the banner of 'There is no god but Allah' above the Big Ben. The nightmare on Downing Street is when one monotheist flies a helicopter all the way to the top of the Big Ben. He removes those numbers, and replaces them with Arabic numbers." "As you all understand, we as Muslims are not those type of coconut-chocolate moderate Muslims—the ones who bow their heads down to the government. Rather, we are the ones who want to work for the sake of Allah, to establish the manifestation of Islam, and make sure that [British Prime Minister] David Cameron comes on his hands and knees and gives us the jizya [a "protection" tax paid by Jews, Christians and other "infidels" to Muslims], yeah, that's right, and cover up all the women and put a niqab [face-covering veil] on their faces, including Queen Elizabeth and Kate Middleton, the whore, the fornicator. As it turns out, Waleed, whose real name is Shahid Janjua, is unemployed and lives on welfare benefits he claims for himself, his wife and his three disabled children. He also lives in government-provided housing in Hounslow, West London. At the same time, Waleed mocks the British government for handing out benefits and encourages his followers to cheat the system. "We have a lot of money today from the income support and the incapacity benefit. Obviously when you have the incapacity benefit, you want to make sure you walk with a limp when you leave the house just in case there's someone taking pictures." The British-born Choudary has long said that Muslims are entitled to welfare payments because they are a form of jizya and as such are a reminder that non-Muslims are permanently inferior and subservient to Muslims. "You find people are busy working the whole of their life. They wake up at 7 o'clock. They go to work at 9 o'clock. They work for eight, nine hours a day. They come home at 7 o'clock, watch EastEnders [a British soap opera], sleep, and they do that for 40 years of their life. That is called slavery. ... What kind of life is that? That is the life of the kafir [unbeliever]." "People will say, 'Ah, but you are not working.' But the normal situation is for you to take money from the kafir. So we take Jihad Seeker's Allowance." "We take the jizya, which is ours anyway. The normal situation is to take money from the kafir [unbeliever]. They give us the money. You work, give us the money, Allahu Akhbar [Allah is greater]. We take the money." He then adds: "Hopefully there's no one from the DSS [Department of Social Security] listening to this." Choudary, who is married and has four children, enjoys a rather comfortable lifestyle that is being paid for by British taxpayers, year after year. He is thought to receive more than £25,000 ($43,000) a year in welfare benefits. Because his welfare payments are not taxed, his income is equivalent to a £32,500 salary. By comparison, the average annual earnings of a full-time worker in Britain were around £26,500 in 2013. Meanwhile, Choudary continues his Islamic radicalization activities, effectively unhindered by government bans of his organizations. "I believe that adulterers should be stoned to death. I believe that we should cut the hands off of thieves. I believe the Sharia should be implemented in Denmark. Maybe we should change the Christiansborg Palace [the Danish Parliament building] to Muslimsborg to have the flag of Islam flying over the parliament in Denmark. I think this would be very nice."